Jennifer Merin: Filmmaker Pawel Pawlikowski’s use of stunning ’60s-style black and white cinematography in Ida highlights the stark and gripping story of Anna (Agata Trzebuchowska), a Polish orphan orphan raised in a nunnery and about to her vows, who discovers her heritage is Jewish and sets off with her only living relative, Aunt Wanda (Agata Kulesza), to find out what happened to the rest of their family during the years of the Holocaust. An unusual coming of age story, to say the least, with overtones of challenged self-identity, family secrets and the confrontation of prejudice. Kudos to both Agatas for their nuanced and affecting performances, made all the more profoundly human by surprising sparks of humor. It’s a must see! Pam Grady: Writer/director Pawel Pawlikowski’s first film to be shot in his native Poland, Ida, is a gorgeously lensed, fascinating look at that country’s post-World War II legacy and its Communist era. It is also an entertaining road movie as a young nun about to take her final vows discovers that she is Jewish, sending her on a journey with her ex-Party aunt to discover what became of her parents during the war. Sheila Roberts: Ida, which marks Polish-born, British writer-director Pawel Pawlikowski’s first film set in his homeland, is a gorgeous, fascinating, heartfelt story of a young woman who must confront the unexpected truth about her family. Her life is forever changed by the discoveries she makes after she embarks on an unexpected journey to uncover her roots. The award-winning film features a stunning performance by newcomer Agata Trzebuchowska. Read interview with Pawel Pawlikowski. Loren King: I’m a fan of Polish-born, British writer-director Pawel Pawlikowski so I was eager to see his third feature and the first set in his homeland. 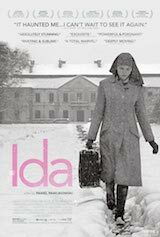 Shot starkly in black and white, Ida is set in 1962 Poland under bleak Communist skies. 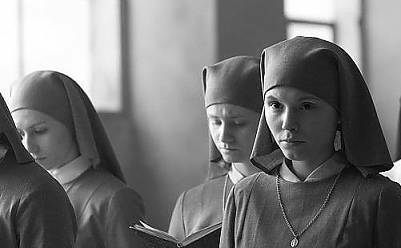 The story of wartime secrets and overwhelming sorrow is illuminated by the breakout performance of Agata Trzebuchowska as Anna, an eighteen-year-old woman preparing to become a nun at the convent where she has lived since orphaned as a child. It’s an unsettling but beautiful film. AWFJ Movie of the Week Panel Members: Nikki Baughan, Anne Brodie, Pam Grady, Leba Hertz, MaryAnn Johanson, Loren King, Cate Marquis, Jennifer Merin, Nell Minow, Rebecca Murray, Kristy Puchko, Carrie Rickey, Sheila Roberts, Jeanne Wolf, Sara Vizcarrando. Audiohollywood.net was started by entertainment journalist Sandra Kraisirideja, an accredited member of the Motion Picture Association of America. A 16-year industry veteran, her work has appeared in the Los Angeles Times, Entertainment Today, SciFi.com, ComingSoon.net, LatinoReview.com, North County Times, East Hampton Star and Southampton News-Press. Ms. Kraisirideja is listed in the (MPAA) Domestic Press Directory for 2009.